Your concerns are important to us, and we assure you that we work with our customers day in and day out until their concerns are fully addressed. We understand that this has been a frustrating matter for you, and we’ll be in touch with you shortly to continue working on a resolution. We thank you for your patience. It was resolved to my satisfaction. I hired someone else. I am still working on the best solution for me. But getting much closer to a resolution with Empire Today. I guess I am repeating myself but I still do not have closure. I feel that my flooring installation is a hostage. I do not want Empire Today to come back to my home and I want the balance removed from my account so I can hire a professional. 4 crews have been sent to fix the unprofessional installation along with 2 different supervisors and now Empire Today wants to install new flooring. I cannot accept their unprofessional installation as I had given them many chances. I have been disappointed every time they left, it does not look better. Because I will not accept a new flooring by another unprofessional Empire Today flooring contractor or a reduction in the balance I will be sent to collections. I have emailed a estimate from a licensed flooring contractor that will put in new flooring and new baseboard for more than I paid for Empire Today. The contractor removed the quarter round and saw the uneven cut that has been covered up by quarter round. He feels it cannot be fixed and I have been saying that all along. The vinyl that was installed was cut uneven and the vinyl installation should have been done in a professional manner. For example the closet runners should have been removed and the vinyl should have been put under the closet strip. I had hoped to get an estimate on new baseboards but the vinyl is cut so poorly it could not be covered up to baseboard is whide enough. Empire Today will not replace baseboards, or fix the wall damage. Or other damage done by the installation. I am requesting that my balance be removed so I can have a professional install new flooring. If I accept a lower balance from Empire I have to sign a waiver stating that I cannot say anything negative about Empire Today and waive any rights to the flooring warranty. Not worth it by the way it looks today. 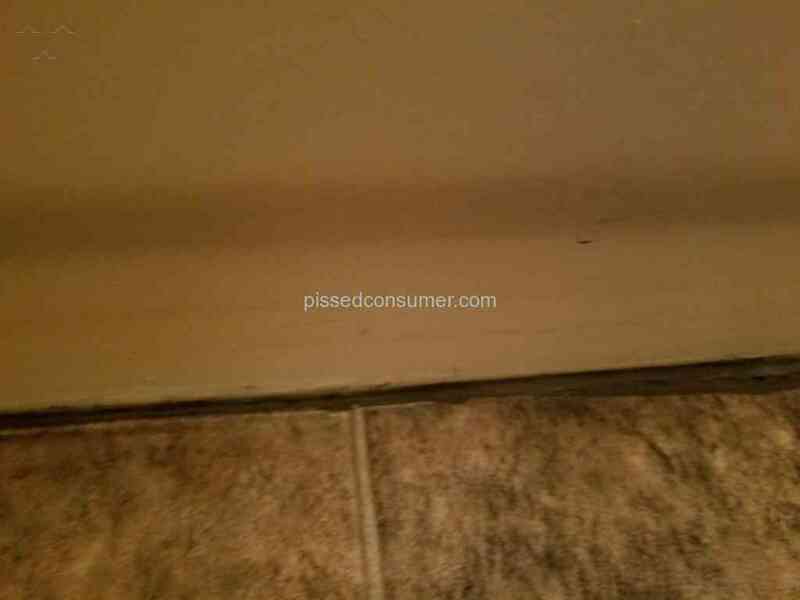 The caulking around the toilets is also sloppy and unprofessional and usually not done when installing hard surfaces. Does Better Business Bureau Care? Should I try them next? Just wondering. After 4 crews from Empire Today and 2 inspection supervisors could not fix the damage I am requesting that I will no longer be held responsible for the unprofessional installation balance. New floor has to be installed. I have received estimates from licensed contractors that are professional flooring installers. I had hoped to have new baseboards installed to cover up the damaged baseboards and large quarter round used by Empire Today. But the flooring cannot be fixed because the vinyl was cut incorrectly. 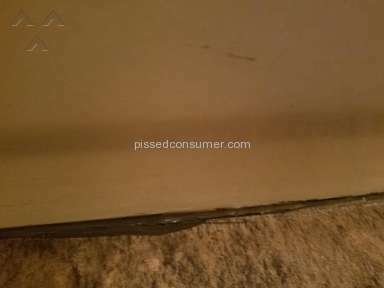 New baseboard would not cover up the unprofessional installation and unevenly cut vinyl. 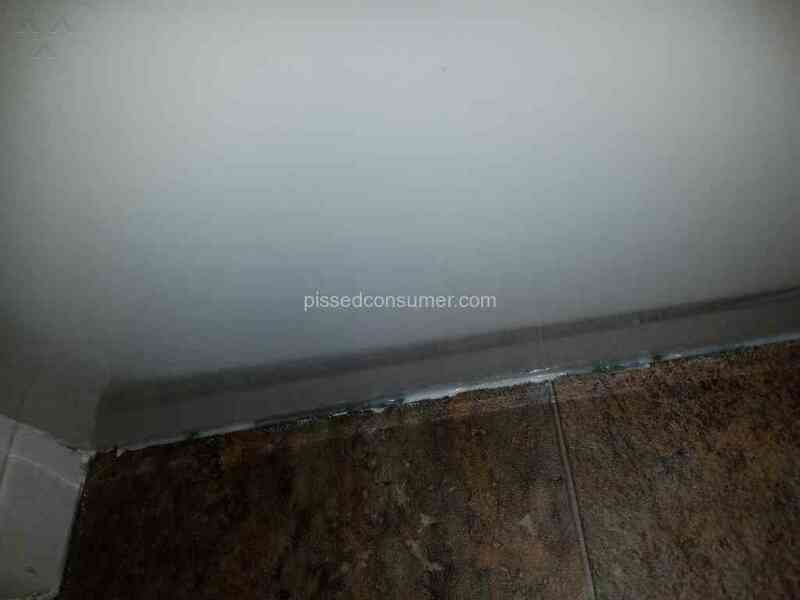 Even around the toilets there was a lot of caulking to cover up the vinyl that was cut incorrectly. I have given Empire Today many chances to fix the damage and do not want them to return to my home again. I have been disappointed too many times and do no feel there are professional flooring installers that work for Empire Today that work in my area. This is still not resolved!!! I have been in contract with customer relations but after 4 crews that have come to repair it is still as the photos attached, very unprofessional. I have been offered another crew to put in a new floor but I don't bevel the damaged baseboards or wall will be repaired. I am now being sent to collection for the balance. As I said before I have been intimated and called a liar by the original installers. I have waited several times for crews in the 4 hour windows for them to show up sometimes not at all. The 15 page contract that I signed (on a ipad) notes only arbitration and I have not had that yet. I have been speaking with customer relations for many months since the day it was installed. I did not like the installation from the beginning and wanted them to stop. The installers said they had to do the job and that we could complain later. (I should have sent them home without finishing). Customer Relations have been helpful in trying to resolve my installation problem. It is very difficult to remove quarter round and caulking that was installed unprofessional and sloppy the first time. Empire Today has sent crews out 4 times to try and fix the initial installation plus 2 supervisors. The original crew, that I requested not to return, came back to remove all of the white caulking and white quarter round. They also left marks from the old quarter round and left over white caulking in different areas. I felt intimated by this original crew when they returned. They really did not want to remove all of white caulking that was applied everywhere. See the photos. I was told by the salesman a small bead would be used by the bathtub areas, that was not the case. Caulking was everywhere. In the original 15 page contract, I requested two bathrooms done with vinyl, which seemed like a good product. But a large roll is hard to manage by one person. The product is good but the installation was done unprofessionally. Glue and cement was applied to the walls and doors that should have been on the floor. Right now I am negotiating a large reduction in the installation cost due to the many times I had to wait for a 4 hour window and it still needs a lot of work. My baseboards have been damaged from the previous white quarter round. The paint the last crew used was white and my baseboards are a beige color. 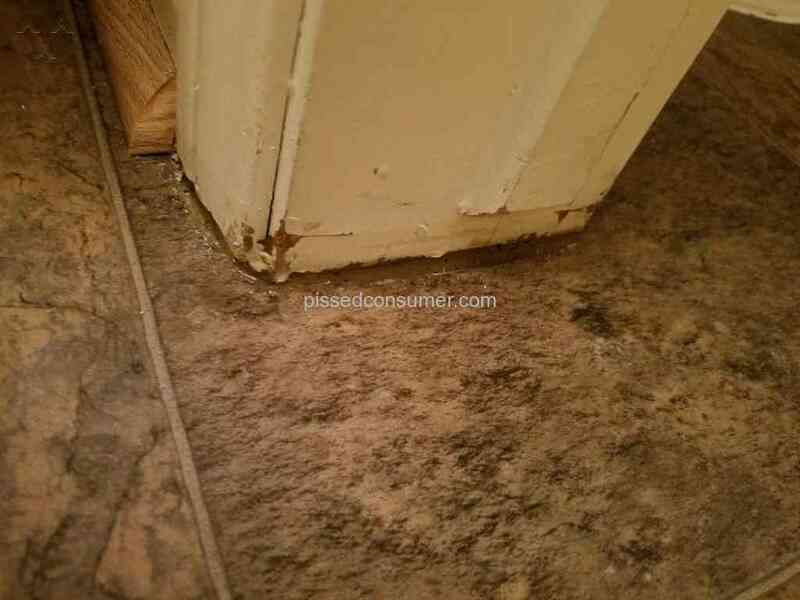 The old caulking is still showing in different places and by removing the caulking more damage was done to the baseboard and flooring. Empire Today wants to re-install the flooring with a good crew. I am done, and I do no have the time to spend the day or 2 with any more Empire Today crews. I will have my local flooring expert put new baseboards in and do a professional job at a great expense to me. Hope these details are clear to anyone following this installation problem. Review #1202493 is a subjective opinion of toniburke.